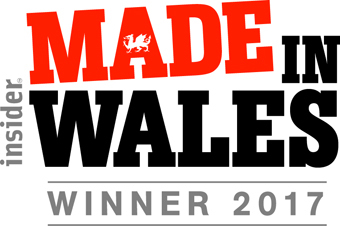 Invertek Drives continual growth in the global export market, which sees some 90% of products manufactured at the company’s Welshpool factory destined for more than 80 countries, has been rewarded with a Made in Wales Award. The awards, now in their seventh year, celebrate the achievements of manufacturers from across Wales, and Invertek Drives was one of five finalists for the Export Award beating off SPTS Technologies, Dr Organic, Spectrum Technologies and Tiny Rebel Brewing to take the title. Winners were announced at a Cardiff City Hall dinner hosted by TV and radio presenter Alexis Conran. Rhydian Welson, Sales and Marketing Director, says: “This year has been a momentous one for Invertek with us celebrating the milestone of selling our one millionth variable frequency drive as well as starting work on our new factory. “Welshpool has been our headquarters since the company was first founded in 1998 and 2017 has seen work start on our new 5,500 m2 factory which is being built next to our current one, reaffirming our commitment to being a leading manufacturer based in Wales. “To now receive this Made In Wales Award really is the icing on the cake for us because we are very proud of our Welsh heritage. “The new factory, set to be operational towards the end of 2018, will enable us to further grow our exports by enabling us to manufacture more than 400,000 variable frequency drives every year in Welshpool which will also create jobs for the area. “I would also like to congratulate our fellow finalists who all show that Wales really offers a vibrant environment in which successful businesses can very much thrive on the international stage as well as the other companies who took titles on the evening. “The whole event showcased some incredible Welsh businesses and showed that Wales is a great place in which to work and why companies such as Invertek Drives continue to invest in the country,” he added. Invertek designs, manufactures and markets a range of compact, easy to use AC variable speed drives which are used to control electric motors in industrial automation applications around the world. First established in 1998, Invertek employs more than 190 people in Wales alone. This latest success follows Invertek Drives Ltd scooping a hat-trick of accolades at the 2016 Powys Business Awards, including being named Overall Powys Business of the Year for the second time in a row. Invertek also received awards in the ‘Technology and Innovation’ and ‘International Trade’ categories. Find out who the winners were in the other seven categories here.